Braswell upgrade. Acer's little 11.6-inch laptop attracts attention with noiseless operation and a long battery life. That makes life difficult for Chromebooks. Acer's Aspire ES1-131 is no stranger to us. It is the identically built successor of our previously tested Aspire ES1-111. Only the innards have changed: A brand new Braswell CPU now replaces the Bay Trail processor of the ES1-111. Our report uncovers whether or not that involves advantages. The Aspire has plenty of rivals. We would firstly name netbooks, such as Asus' EeeBook X205TA-FD005BS and Lenovo's S20-30. However, Chromebooks like Lenovo's N20 also belong to these. Convertibles, such as HP's Stream 11 x360, should not be forgotten, either. Since both tested Aspire models feature an identical build, we will not go in-depth about casing, connectivity, input devices, screen or speakers. The corresponding information can be found in the review of the Aspire ES1-111. Opening the casing is no problem. The base tray can be easily removed after releasing all screws on the underside. However, the user cannot do much. The working memory and system storage are soldered onto the motherboard. The casing has a slot for a 2.5-inch hard drive. However, a hard drive could not be installed in our review sample because there was no corresponding connector. 2.5-inch hard drives are only meant for other Aspire models. The Aspire sports the same matte HD screen as the Aspire ES1-111. The rates differ marginally anyway. That is normal since two identical screens never correspond to each other exactly. Acer's 11.6-inch netbook has enough computing power for applications from the office and Internet fields. It can offer long battery life at the same time. Our review sample costs around 250 to 300 Euros (~$271 to ~$326). Acer also has other configurations in its lineup. 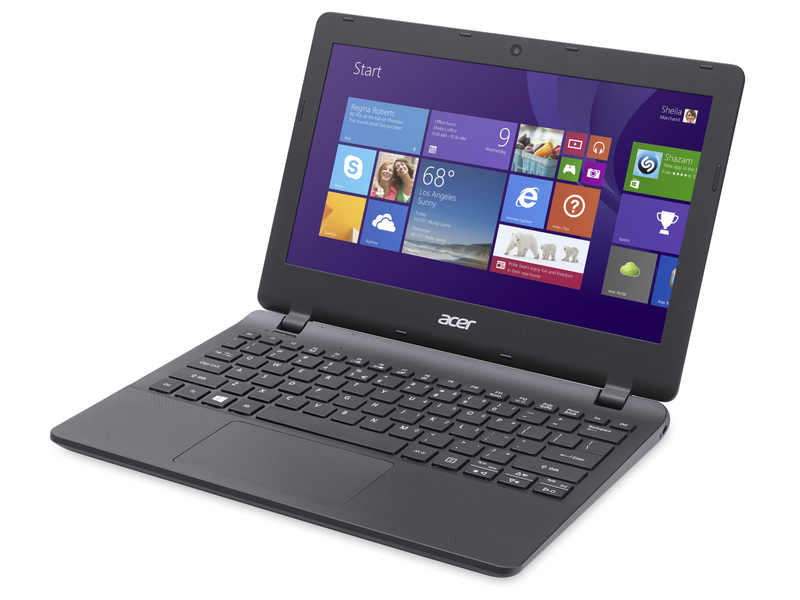 The Aspire is powered by a Celeron N3050 dual-core processor. It is a scion of Intel's latest Braswell CPU generation. The processor clocks at up to 2.16 GHz, which makes it to the successor of the Celeron N2815 (Bay Trail) processor. Both CPUs are virtually identical in terms of performance. The Braswell processor manages a lead of a few percent in some benchmarks. The processor always performed multithread applications at full speed, which was also mostly true for single-thread applications. However, one processor core was recurrently slowed down to 1.6 GHz. This behavior was identical in both AC and battery modes. The system ran smoothly and we did not encounter problems. All PCMark 8 benchmark scores are better than those of comparable rivals for two reasons: Firstly, the Aspire has been equipped with an eMMC storage, which operates faster than conventional hard drives. Secondly, the netbook features a significantly stronger GPU than the case in devices based on the Bay Trail generation. It is not possible to improve the Aspire's system performance. The system drive is an eMMC storage module with a capacity of 32 GB. That is the absolute minimum required storage capacity for a Windows system. The user has approximately 10 GB for personal use available in state of delivery. The remaining storage is divided among the Windows installation and recovery partition. Some of the preloaded applications can be uninstalled for gaining additional storage capacity. The storage device's transfer rates are on a normal level for eMMC storage. While the CPU part of the Celeron N3050 only presents a very slim performance plus over the former generation, it looks much better with the GPU. An almost 100% performance increase can be observed in the HD Graphics (Braswell). The GPU is based on the same architecture as the graphics cores in Intel's Broadwell processors. The 3DMark benchmark results range on the same level as those of AMD's R2 (Mullins/Beema) or R3 (Mullins/Beema) graphics cores. Thus, Intel meets AMD on equal footing for the first time in low-cost GPUs. The slowest HD Graphics core version is installed in our present review sample. It clocks at up to 600 MHz. Other GPU variants can achieve up to 700 MHz. Furthermore, the working memory installed in our review sample operates in single-channel mode. Consequently, there is still some leeway, and the HD Graphics core will achieve even higher scores in the 3DMark benchmarks in other laptops. Therefore, Intel's new GPU not only stands out with a higher performance but also with the ability of rendering 4k videos and H.265 encoded videos (H.265 is the successor of the known H.264 codecs). We also tested this as far as we could. YouTube videos (H.264, 4k, 60 fps, Internet Explorer) were rendered smoothly. The CPU was loaded to approximately 60%. It was also possible to play videos using Windows Media Player. The CPU's load then ranged between 50 and 60%. The Aspire was not made for playing up-to-date 3D games. Although the laptop features a considerably stronger GPU than comparable Bay Trail models, its performance will hardly be enough for games. Only a few titles achieve playable frame rates. Users who want to play should stick to the casual games available in the Windows Store. The Aspire performed the stress test in the same manner in both AC and battery modes. 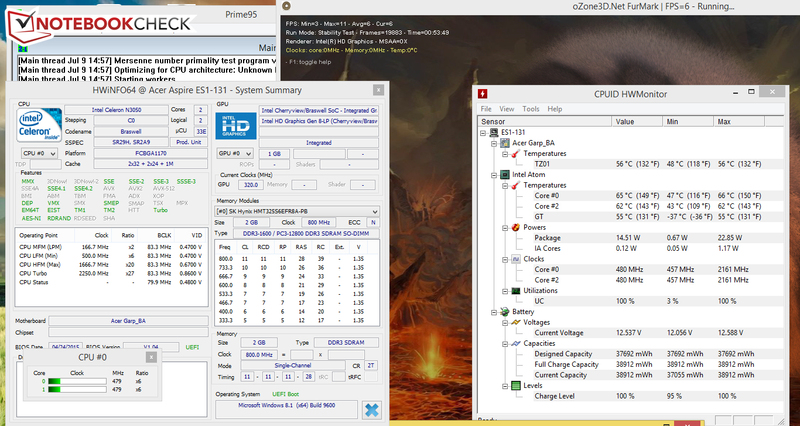 The processor clocked at 480 MHz and the graphics core at 320 MHz. The laptop did not get exceptionally warm. 40 °C was only surpassed on some measuring points in the stress test. That is not surprising since the Aspire is cooled passively. (±) The average temperature for the upper side under maximal load is 34.5 °C / 94 F, compared to the average of 29.8 °C / 86 F for the devices in the class Netbook. (+) In idle usage, the average temperature for the upper side is 27.7 °C / 82 F, compared to the device average of 29.8 °C / 86 F.
(±) The average temperature of the palmrest area of similar devices was 29.3 °C / 84.7 F (-1.2 °C / -2.2 F). The Aspire is satisfied with very little power when idling. We ascertained a maximum power consumption of 4 watts here. That undercuts the Bay Trail sister model a bit. The requirement only climbed to 8.5 watts during the stress test because both the CPU and GPU were throttled very strongly. We simulate the load induced when opening websites in the real-world Wi-Fi test. The "Balanced" profile is enabled, and the screen's brightness is set to approximately 150 cd/m². The Aspire achieved a runtime of 9:14 hours, which is a very good time. It thus runs considerably longer than its Bay Trail sister model (5:29 h). Our present review sample (37.7 Wh) has a somewhat higher battery capacity than the Bay Trail model (30 Wh). 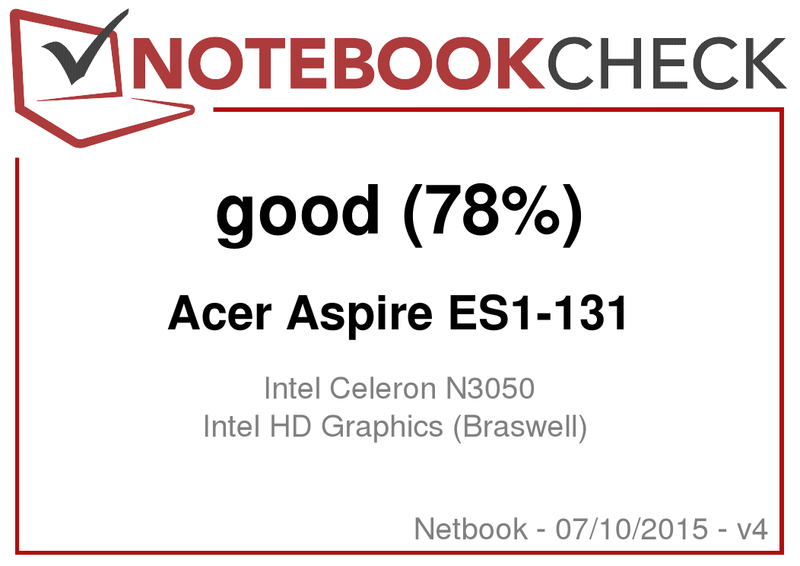 In review: Acer Aspire ES1-131-C5J5. Test model courtesy of Acer Germany. The computing power of the installed Braswell processor is enough for office and Internet applications. The little laptop can also render videos smoothly - including 4k material - thanks to the graphics core. The slimmed structure width of the Braswell SoC reduces its energy requirement somewhat compared with the Bay Trail precursors. That - alongside a slightly higher battery capacity - can be translated into considerably better battery runtimes. The storage is tight, and it should be expanded via an SD card after purchase. The laptop's matte screen is quite appealing in view of the price level. It offers a decent brightness and acceptable contrast. The combination of a decent keyboard, matte screen and long battery life turn Acer's ES1-131 into a small, portable typewriter and browsing machine. 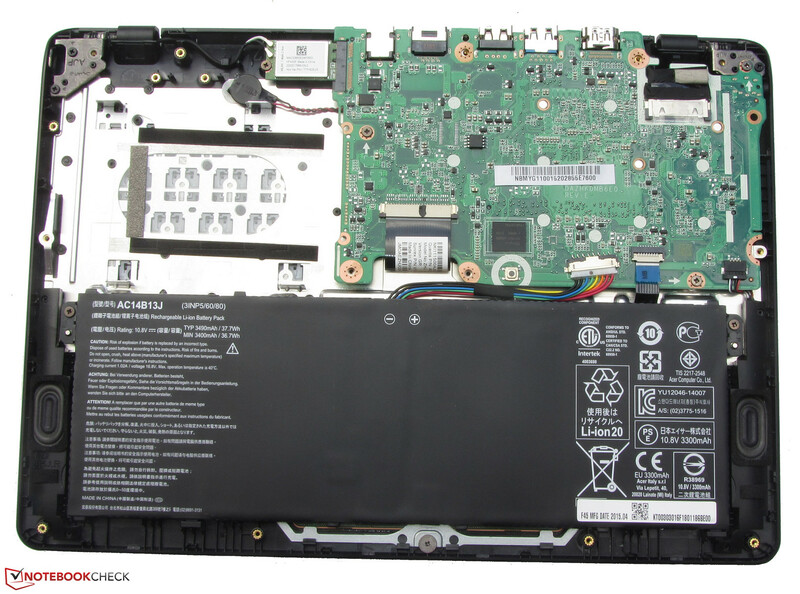 It is a direct opponent for Chromebooks, which it meets at eye level in terms of battery runtime.